On Sept 19, 2012 I had the rare opportunity to attend a full day of lectures delivered by an international gathering of Van Eyck experts at the 2012 Van Eyck Studies Colloquium in Brussels. This event, hosted by The Royal Institute for Cultural Heritage (KIK-IRPA), follows two years of intense technical examination of the Ghent Altarpiece, now undergoing urgently required restoration. The results of this work as well as high resolution imagery is available at Closer to Van Eyck, supported by The Getty Foundation. The conference provided a timely opportunity for academics and scientists to synthesize this and other recent research into Jan and Hubert van Eyck's life and art. The year 1432 is extracted from the red letters doubling as Roman numerals in the last line. According to Van der Velden, Hubert may have started the painting as a commission for the town hall, but died in 1426 before completion. In fact, one of the few remaining documents concerning Hubert van Eyck concerns a commission from the magistrates of Ghent. Only several years later did Jodocus Vijd commission Jan van Eyck to complete it for the occasion of the baptism of Prince Joos of Burgundy, the son of Duke Philip the Good and Isabella of Portugal. This took place on the 6 May 1432, in the church of St John (now St. Bavo’s Cathedral). Here the painting was premiered directly above Hubert’s tombstone. This hasty re-commission may explain the later addition of the baptismal fountain of life. The lack of underdrawing for the fountain can be seen clearly in this infrared reflectography. He proposes only the lower tier of the painting would have been completed and displayed for the occasion, along with the lost predella. The predella is understood to have depicted hell or purgatory, and Van der Velden argues the case for purgatory. The baptismal water in the central panel is flowing directly down toward the predella, but there is no holy water (nor hope) in hell. By contrast he offers the possibility of living waters flowing down to wash the sins of the hopeful in purgatory, cleansing in particular the soul of Hubert van Eyck, who was resting in his tomb below the painting. Thus on this day, Hubert was nourished through his art to eternal life, and the circle of life – birth, baptism, death, and redemption - was complete. The day was a joyous celebration, and the painting such a sensation, Van der Velden suggests, that a commission to extend it and add a second tier was made on the back of this success. He further discussed evidence of the painting being displayed at the grand private residence of Jodocus Vijd after the baptism, supporting the notion that the painting was originally a celebratory commission rather than a consecrated altarpiece. Moving it to a private residence would have de-consecrated it. This charismatically presented lecture threw down the gauntlet for the rest of the day and the room noticeably perked up whenever Van der Velden's hypothesis resurfaced. The first challenger was Bernard Ridderbos, of the University of Groningen, who focused on the life and motivations of the altarpiece's patron, Jodocus Vijd. He wonders why such an unremarkable Ghent politician ended up commissioning the largest and most complex set of panel paintings executed in fifteenth century Netherlands. Jodocus Vijd, he infers, suffered from deep social insecurity despite his considerable wealth. Firstly he suffered the shame of his father's disgrace at being found guilty of financial fraud. Secondly, his political career was unremarkable, and finally, he and his wife were childless. He chose to secure his family’s legacy with a grand altarpiece intended for his specially commissioned Vijd Chapel in the church of St. John. The Soldiers of Christ could refer to the knighthood of Jodocus’s father Clais and of his brother Christoffel, the Holy Pilgrims, led by Saint Christopher, patron of Christoffel Vijd, to Jodocus’s foundation of a hospice for pilgrims, and the Holy Hermits to the Charterhouse at Rooigem patronized and chosen as a burial site by Clais Vijd. He argued against the keynote hypothesis of an independent lower tier. The Ghent Altarpiece was part of the equipment of the church of Saint John and even of the city, because John the Baptist was also patron of Ghent. His prominence in the upper register and that of his usual attribute, the Lamb, below, can be explained by this double function and underscores the character of the work as a civic monument. Although important, the civic and Vijd family symbolism is trumped by its function as an altarpiece for the Mass. A treatise on the Eucharist by a Ghent author, completed in 1440 revealed that ‘the inscriptions and images on the interior of the Ghent Altarpiece all relate coherently and simply to a single theme: the communion of the mystical body with its head, through the sacrament of the Eucharist’. He argues the living water from the fountain symbolically flowed in the direction of the priest's Eucharist on the altar. Also disputing Van der Velden's hypothesis was Luc Dequeker of K.U Leuven. He proposed that the painting wasn't purely a devotional painting, but also illustrated political themes. He agrees that the date May 6, 1432, as well as the cityscapes of Ghent and Sluis refer to Philip the Good, represented on the panel of the Just Judges. He sees a Jewish theme throughout coinciding with a political hot topic of the time - equal rights for Jewish converts to Christianity. Note that Eve is holding an etrog, a citrus fruit associated with the forbidden fruit in Jewish tradition. He sees the central panel as depicting a Messianic vision of paradise on earth before the end of time. Within this, the presence of the converted Jewish prophets support the theme of universal salvation of humanity and the ultimate conversion of the Jews. He proposes that it was originally intended to as a diplomatic gift for Philip the Good’s residence in Ghent, the Prisenhof, but was later adjusted symbolically and installed in the church of St. John. Following this lively sparring of theories, Pascale Fraiture's presentation of dendrochronological analysis offered some fascinating facts to the mix. The panels of the Ghent Altarpiece came from 20 Baltic oak trees. Slow growth trees are the most resistant to shrinkage, and 66% of the panels of the altarpiece are from slow growth trees several centuries old, the oldest reaching 400 years old. The trees for the lower section would have been felled between 1415 and 1432 and those for the upper section between 1417 and 1434. Finally, the amazing possibility that computers could be programmed to distinguish between artists’ hands was raised in the poster presentation, Spatiogram Features to Characterize Pearls in the Ghent Altarpiece, by Ljiljana Platiša, Bruno Cornelis, Tijana Ružić, Aleksandra Pižurica, Ann Dooms, Maximilian .P.J. Martens, Marc De Mey, and Ingrid Daubechie. The team measured and analysed the spatial characteristics of pearls painted by Van der Weyden and Van Eyck. The outcome was a unique mathematical 'pearl technique' signature for each artist. I wonder if they have applied this approach to the Ghent Altarpiece to see if they can distinguish between Hubert and Jan’s hands? The full programme of lectures given at the Van Eyck Studies Colloquium can be found here link. The proceedings will be published in 2013. 1. Ridderbos, B, A.van Buren, and H.van Veen, eds. 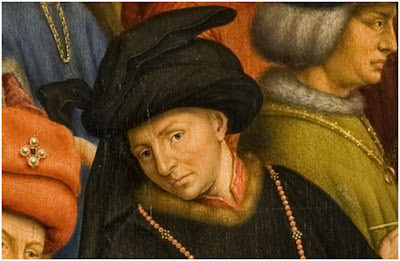 Early Netherlandish Paintings: Rediscovery, Reception, and Research. Amsterdam University Press (2005), p. 52. 2. 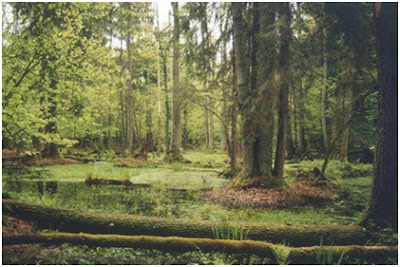 Ridderbos et al. ibid p. 53. 3. Harbison, C. Jan van Eyck, The Play of Realism. Reaktion Books, (1997), p. 194. 4. Ridderbos et al. op cit p. 54. 5, 6. Ridderbos et al. ibid p. 55. Glennis McGregor is a painter and digital design professional working in London, UK, and is an associate member of the International Academy of Digital Arts and Sciences. Her blog, Renaissance for Real, explores the parallel movements of contemporary 3D art with Renaissance painting. The idea for this blog came to her on the way home from watching Up 3D, the visual experience of which felt somehow akin to the dazzling unveiling of a van Eyck altarpiece to Ghent church goers of the early 1400s. Excellent. I have seen the stunning altarpiece, but had never heard that Jodocus Vijd commissioned Jan van Eyck to complete it for a special occasion (the baptism of Prince Joos of Burgundy, the son of Duke Philip the Good and Isabella of Portugal). I think a thinking viewer always has to know about patronage because otherwise too many of the elements in the work may not make sense. The civic and Vijd family symbolism would have gone straight over my head, alas. One little quibble. Far from the etrog being forbidden fruit, it is actually the Beautiful Fruit for Succot. It is protected in silken wraps and stored in a specially shaped box made from precious material. The etrog is examined, treasured and protected, so precious is it. My husband's uncle, Stewart Leonard, Director of the St.Louis Art Museum was earlier a member of the art restoration project in Munich(?) at the end of WW2. We have a letter in which he says, "At present, I have in my office the Altarpiece of the Lamb" and goes on to list a dozen other mind-blowing paintings. Ljiljana Platiša, Tijana Ružić, Aleksandra Pižurica? It's so nice seeing some people from the Novi Sad and my own university working on such a project. And it's always a pleasure learning more about such a masterpiece. Also all reports about the project are freely available in pdf: digital art history in practice! Many thanks, Glennis, for sharing this fascinating summary. I seem to remember that the etrog (very timely this reference, at Sukkot!) was also traditionally associated with childbirth--which seems immediately relevant to Eve's role as progenitrix of the human race. I attended all three days of the Colloquium. And besides that I was lucky to be given the opportunity to visit the KIK-IRPA studio's on the day before. They will be restoring the panels of the Mystic Lamb. Have a look at the picture-gallery at my website. There you can find some examples of copies I made and some current reconstruction-projects. something went wrong with the links. here they are again. How fortunate to go to Brussels for this symposium! I am currently reading Noah Charney's book on the Ghent altarpiece. Such fascinating stories about one piece of art. Thank you for this wonderful post, and the insights from the comments. Check out my web-site ... P.S.